The Theta Network mainnet is now live following the launch of the project’s native blockchain and THETA and TFUEL token ecosystem. Major supporting exchanges such as OKEx and Binance have already announced that they will conduct the swap automatically for users, converting the project’s previous ERC-20 Ethereum-based tokens. Theta was founded in early 2018 and is backed by the e-sports streaming service and Twitch competitor Sliver.tv. Theta believes that it can provide higher quality video streams through a tokenised bandwidth-sharing model between its millions of current platform users. To make this happen, the company will use an off-chain “Resource Oriented Micropayment Pool” that is purpose-built for video streaming. It aims to allow users to create an off-chain micropayment pool that any other user can withdraw from using off-chain transactions and which is double-spend resistant. 😱 16561 TFUEL Donated meant $198.73 was added to prize pool! The Sliver.tv streaming service has already been using TFUEL tokens to give payouts to Fortnite Showdown winners on the platform. The service boasts over 3 million monthly active users, and more than 500,000 users have shared bandwidth on the platform (with the corresponding microtransactions taking place on the Theta testnet blockchain). Theta’s 2019 roadmap was released last week and included highlights such as the release and implementation of the guardian node program (with 100,000 THETA required to stake for a node). Once these nodes go live, community participants can then earn a share of the 5% annual inflation rate of the TFUEL tokens. 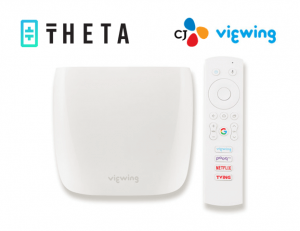 Finally, the company is hoping to “expand Theta content delivery beyond video to support all forms of data (file updates, game patches, video ads, audio/music, and much more)” by the end of the year. Can Theta make a distributed bandwidth-sharing model work for the video streaming industry? Beyond 2019, Theta plans to “leverage new 5G infrastructure and applications” and integrate a hardware ecosystem of “IoT devices, smart TVs, smart cars, and other data transfer-rich applications” into the Theta data sharing “mesh network”. An example of this was recently demonstrated when the team successfully deployed the Theta protocol in the CJ Viewing Box (an Android-based set-top TV box). In the test, the Theta protocol “was able to share video streams between the Viewing Box, mobile devices, and PCs”. The Internet of Things (IoT) market is predicted to double by 2021 to reach $520 billion a year in annual revenue. If the project can deliver high-quality video streaming via an incentive-driven and peer-to-peer model, then the use cases could also be applied to all forms of smart and value-pegged data that needs to be sent across the internet today.